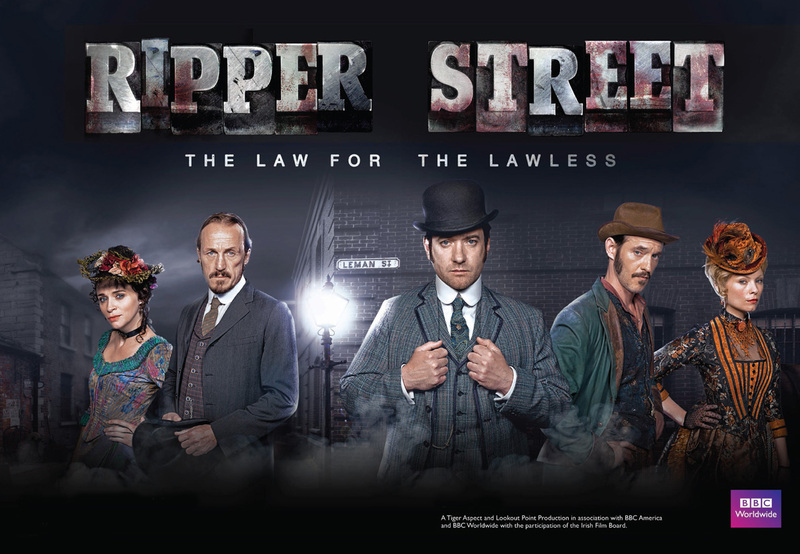 ModwildTV: BBC America's Ripper Street. Worth A Watch? Spending the holidays in England and away from my beloved US television winter finales and/or premieres did have a couple advantages. I saw Doctor Who HOURS before you lot and I was two episodes ahead on Ripper Street by the time my feet hit US soil again. What can you expect from the new series other than superb production, as always? Did you watch Copper? As I watched Ripper Street, I was struck that it does for London's Victorian Whitechapel what Copper did, and will continue doing, for New York City's 1860s Five Points area. There are a lot of similarities between the two programs, and frankly it makes me hesitant to fully recommend it. I was wondering why one of the lower numbered BBC stations hadn't decided to air Copper considering some of the sheer crap they do air, but after seeing the second episode of Ripper Street, I realized the two might be just too damn similar to comfortably air. The protagonists of both series have undergone severe changes due to cataclysmic events in their lives. Both are male and suffer from stress due the loss of a young daughter. Their marriages are in peril and their future in question and their most relied upon companions are people who have been there for them during those times when all seemed lost. They come from all walks of life and might seem otherwise odd choices for men of the law, if we didn't know how deeply they trusted them and why. There is also a madam of prominence in both series, and they are using the dawn of forensics to solve crimes when it was not the common way to do things. If you're one of those people who don't mind watching a lot of similar shows and have already watched Copper, then definitely tune in. Or, perhaps you're more interested in Victorian London. There are many reasons to watch, including superb acting. It took me a few minutes to peg him, but Jerome Flynn who plays Detective Sergeant Bennet Drake is Bronn on Game of Thrones! If you're expecting a show that will revolve around Jack the Ripper, please look elsewhere. This show is devoted to what's left in the wake of his aftermath, not the murders or the killer. Just as Copper focuses a lot on the aftermath of the Civil War. Another similarity. Can I recommend it? Yes. Would I recommend it over Copper, similarly themed? No. But, some of you don't get to make the choice of whether or not to watch both. We in the United States just happened to get lucky this time since BBC America took a risk to deliver us both.